Each year as part of my VBS reviews, I provide a break down of what you can expect to spend if you buy a particular VBS; based on the number of children in your VBS. 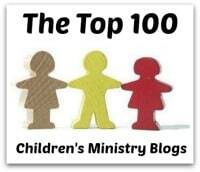 So, today I'm sharing with you my, "Dollars & Cents of VBS" for the VBS resources reviewed in the previous week. While there certainly are excellent and compelling reasons for churches to plan and present a Vacation Bible School to the children in their churches and communities, the realities of the Dollars & Cents can impact whether or not a church is able to do so. If your church chooses to go ahead with VBS for Summer 2016, the Dollar & Cents of it all can again come into play as you determine which resources you will use. I once had someone from a publisher tell me if a church really cared about the children in their ministry, they would spend whatever they had to, to have the best curriculum possible. I disagree. While I absolutely believe churches care about the children in their ministries, budgets are a very real and difficult reality, as so many churches struggle to meet their budgets. VBS can be expensive and yet, it is a very important - and in many cases the only - outreach of the year for many churches. Obviously a starter kit is the first place to begin when purchasing VBS materials, and from there you'll need to determine what - if any - student materials you will utilize. I do have to say, while I absolutely understand the need for publishers to make a profit, so they can stay in business, I am concerned when I see kits increase in price - some of them are extremely expensive. And, if a kit is digital, I absolutely do not understand pricing it so high. Yes, the student materials will not be something a publisher of a digital curriculum will make money on, but many churches do not buy student materials. If a kit is priced so high as a digital kit, there will be many churches which just can not even consider it as an option. As far as student materials, I like the idea of being able to give children something each day which will remind them of the Bible lesson. I especially like the objects/cards which can be clipped or pinned to a backpack as these things make great reminders! I also like the idea of being able to give children their own copy of the music - of course these things take money and your budget just might not have room for them. So, what will it cost and how can you move ahead with VBS on a budget? All student materials are reproducible, so the cost depends on which items you reproduce and what your costs are for doing so. My Dollar & Cents Thoughts . . . While $330 is a lot to spend, since you are able to reproduce all student and teacher materials, in the long run, this VBS might be affordable. Plus, since so many activities are given in the curriculum, you could leave some activities to use in your classes on Sundays. By "stretching out" this curriculum, it makes it even more affordable! Music is not reproducible, so you have to purchase CDs to give kids ranging in cost from $1.96 to $2.40 per CD, depending on how many you purchase. My Dollar & Cents Thoughts . . . Lifeway does not offer a basic starter kit, so unless you decide to purchase just the Director's book and individual Station Leader guides, you will have to buy the kits they offer - in this case you'd need to buy a kit for preschool for &99.99, another for elementary at $99.99, a jump start kit (it is where the director's book will be found) at $34.99 and a Worship rally book/kit for $42 with a total of almost $237.00. For children I'd buy the Expedition tags and music CD at a cost of approx $2.70 per child. The music CD could be given to families instead of each child for additional savings and I really loved the Taking it Home CD, so I would absolutely provide one for each family for another $1.50 per family! Depending on what you do for crafts/stations, you would have an additional expense, but this depends on which ones you buy and how many you need. Lifeway has a variety of additional items available; you would have to decide which items you want to buy. My Dollar & Cents Thoughts . . . Cokesbury does not offer a basic starter kit, so unless you decide to purchase just the Director's book and individual Station Leader guides, you will have to buy the one kit they offer. For children I'd buy the Scripture Treasures stickers for a cost of approximately $3 per child. The music CDs could be an extra at $3.99 per child or family. My Dollar & Cents Thoughts . . . Group does not offer a basic starter kit, so unless you purchase just the teacher books and director book, you will need to purchase the kit they offer. The craft/sciency fun gizmos range in price from $5.99 to $9.99 for ten. The music is available from $4.99 to $6.99 per CD - this may be nice to give each family. I would buy the Bible Memory Buddies, Carabiner, Try it at Home stickers and quest maps for each child at a cost of about $6.80. My Dollar & Cents Thoughts . . . Group does not offer a basic starter kit, so unless you purchase just the teacher books and director book, you will need to purchase the kit they offer. The craft items range in price from $5.99 to $14.99 for ten. The music is available at a cost of $6.99 per CD - this may be nice to give each family. I would buy the Bible Memory Makers for each child at a cost of $3.79. My Dollar & Cents Thoughts . . . Group does not offer a basic starter kit, so unless you purchase just the teacher books and director book, you will need to purchase the kit they offer. 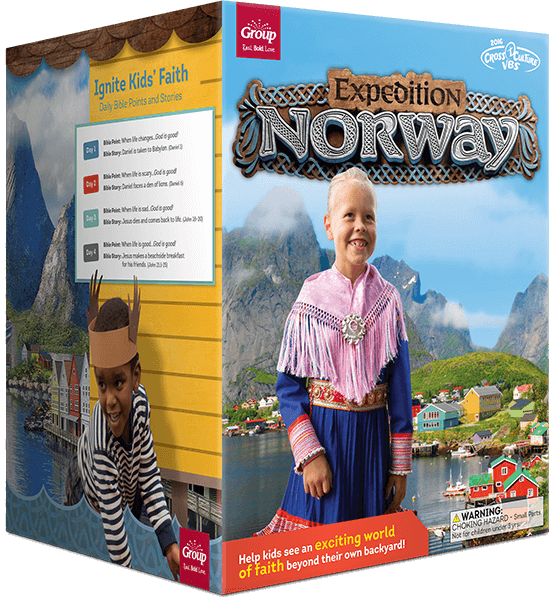 The experience Expedition Norway items range in price from $8.29 to $10.99 for ten. The music is available at a cost of $6.99 per CD - this may be nice to give each family. I would buy the Bible Memory Makers and Carabiner for each child at a cost of $2.73. Do you know if last year's VBS kits and materials can be purchased anywhere? I've found a few on eBay and Christianbook.com, but haven't seen a site that sells (most) everything. I realize that publishers want churches to buy the latest year's materials, but wonder what they do with the items they didn't sell from the previous year.